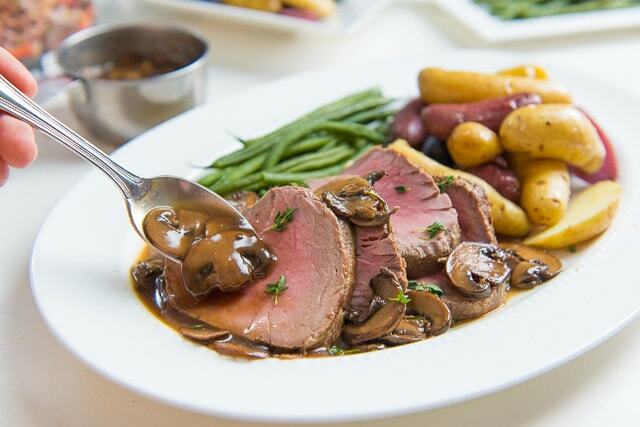 This Beef Tenderloin with Mushroom Pan Sauce is the perfect entree for a special holiday meal without the hassle. Start to finish, it takes under an hour to make! I’ve partnered with Swanson® to bring you this recipe. I think everyone can agree that during the holidays, you want to enjoy great food and great company, with as little hassle and stress as possible. When you’re the one hosting the meal, it can feel like a lot of pressure to pull off a spread of food that is special and worthy of the holidays, without getting overwhelmed as the one making it all happen. After too many stressed-out Thanksgivings and Christmases over the years, this year I vowed to plan manageable meals that still felt like showstoppers, and let me tell you, this past Thanksgiving was a dream. With good planning and the right recipes, I still made the entire meal from scratch, had a wide variety of dishes for the whole meal, and I was actually very relaxed throughout it all. It was such a joy and total game-changer for me as a host. Holiday meals don’t have to be fussy! When Swanson asked me to come up with a holiday recipe that takes less than an hour to make, I got really excited about the idea. 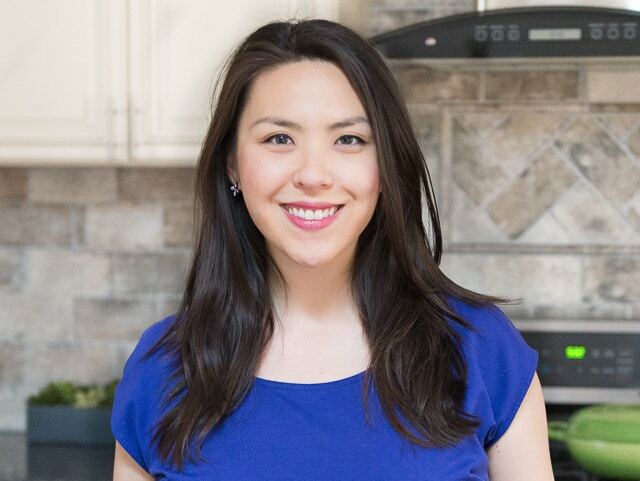 I love to show people that hosting doesn’t have to be so challenging, and you can still wow your guests with delicious food. 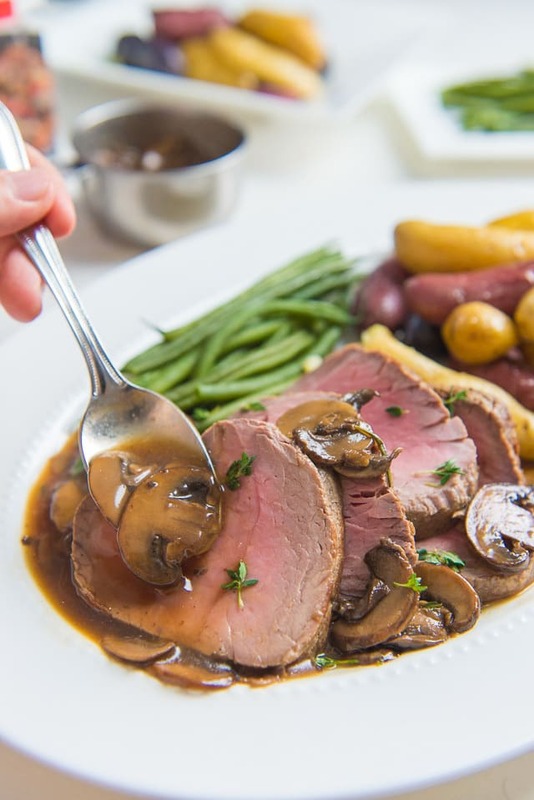 Today we are making a beautiful center-cut beef tenderloin roast, served with a simple baby bella mushroom pan sauce that you make while the beef roasts in the oven. 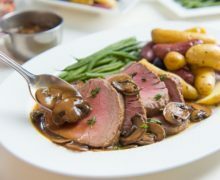 It’s really easy, the beef is luxuriously rich and tender, and the sauce adds an earthiness and saltiness to the dish. 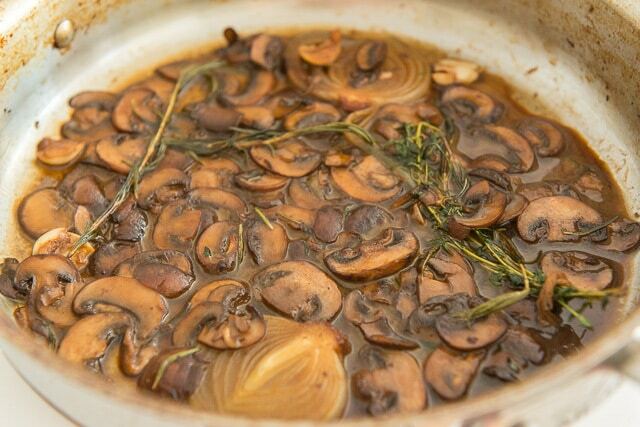 For the sauce ingredients, all you need is rosemary, onion, mushrooms, thyme, garlic, and Swanson Organic Beef Cooking Stock. Because the sauce is so simple, it’s essential to use a stock that has a lot of flavor on its own, and the stock that you choose matters. I love Swanson stocks because they have a really rich flavor foundation and a full body to them. 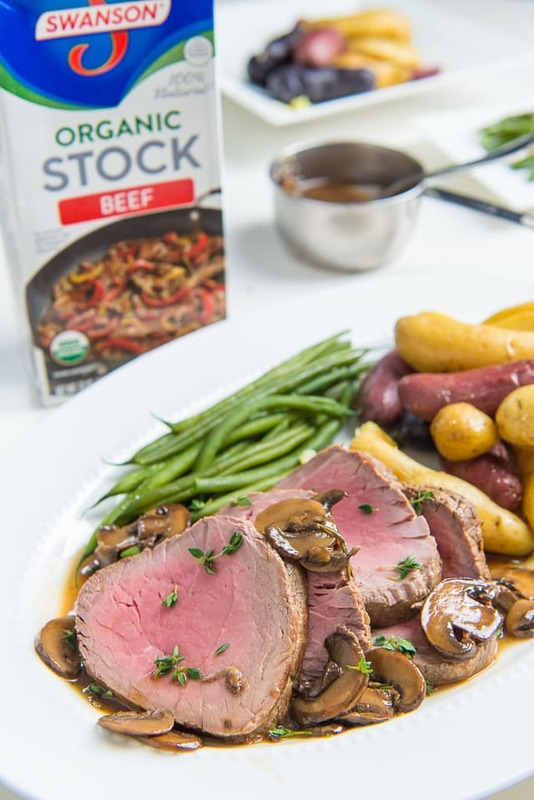 Their organic beef stock is made with organic vegetables and beef from organic pastures. 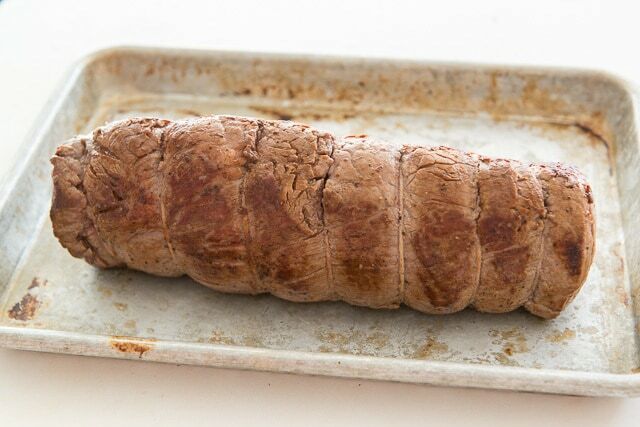 For the beef, season a center-cut beef tenderloin roast all over with salt and pepper. You’ll notice that my beef is tied, which helps the beef retain its round shape as it cooks, and also helps with uniformity. 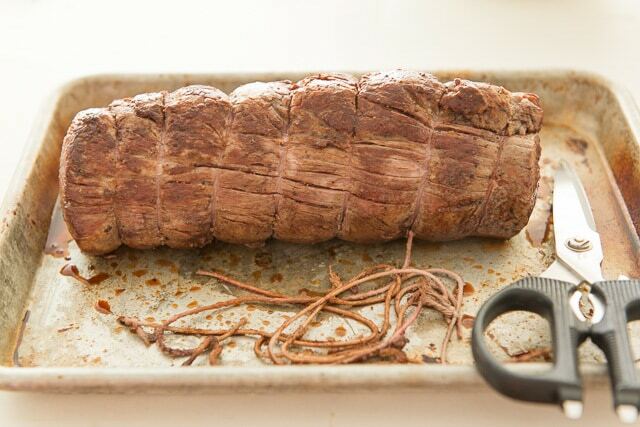 I buy my beef already tied from my butcher, but you can also do it yourself with kitchen twine. Heat a large skillet over medium high heat, then sear the beef in a little bit of oil, until brown on all sides. Remove the beef to a sheet pan, and place into the oven to continue cooking. 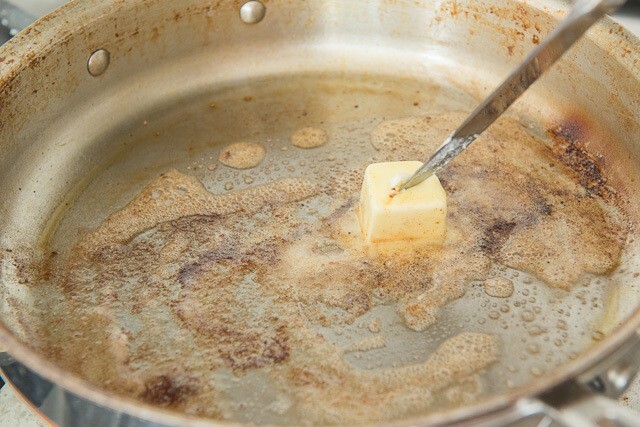 Return to the pan, and add a couple tablespoons of butter to the fond that’s leftover in the skillet. 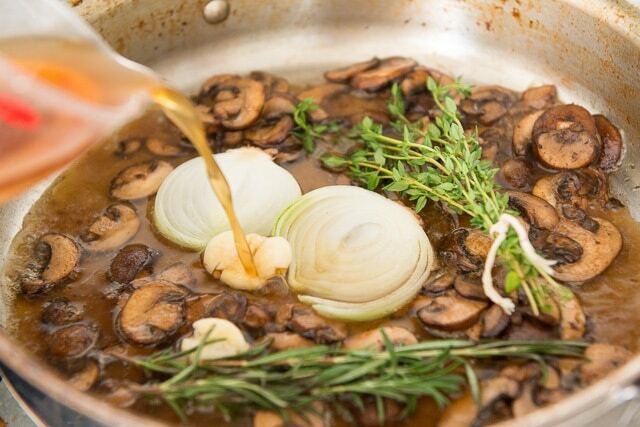 We want to incorporate all the brown bits and drippings in our pan from that beautiful roast! Next add a half pound of sliced baby bella mushrooms, and season with salt. And of course, feel free to use other types of mushrooms! I also love using Hen of the Woods mushrooms or Chanterelles. 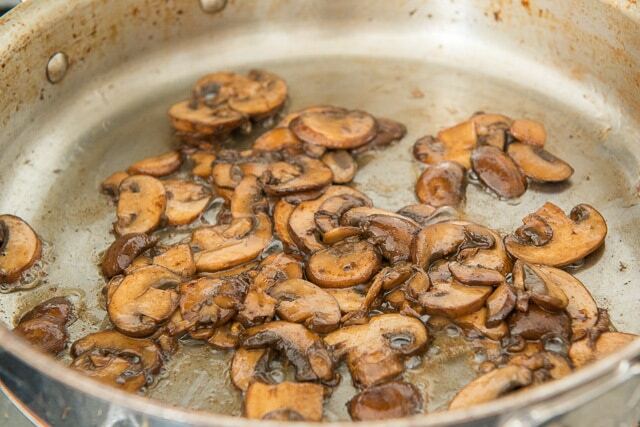 Cook the mushrooms for about 10 minutes until they are brown, and all liquid released from the mushrooms has been cooked off. Now add a couple cloves of smashed garlic, fresh thyme, fresh rosemary, a couple slices of onion, and Swanson Organic Beef Cooking Stock. You’ll notice that I cut the onion through the root, so the slices are connected and easy to remove later. Bring the mixture to a boil, and stir all the ingredients around to submerge the herbs into the liquid. Cook the mixture for about 8-10 minutes until the liquid is reduced by half. Remove the herbs, onion, and garlic from the sauce, then the sauce is ready to stand by for the beef. 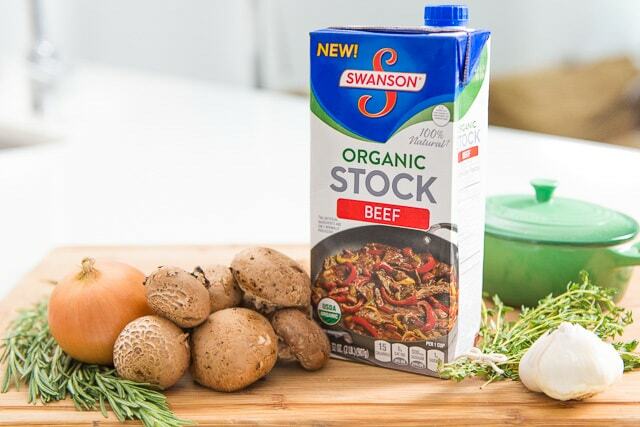 If at any point the sauce gets too thick, simply add more of the Swanson Organic Beef Stock to adjust. Once the beef is done, which should happen right around the time you finish the sauce, let it rest for 10 minutes. Then cut the twine off. Cut the beef into slices, however thick you’d like, and serve with the mushroom pan sauce. To round out the meal, I like to serve the beef with haricot vert and roasted fingerling potatoes. Hope you give this a try for your holiday dinner, and enjoy! 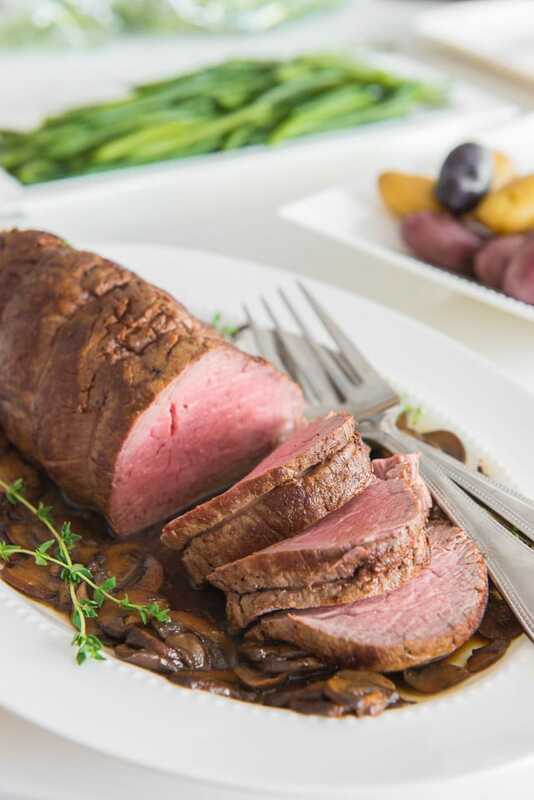 This Beef Tenderloin with Mushroom Pan Sauce is the perfect entree for a special holiday meal without the hassle. Start to finish, it takes under an hour to make! 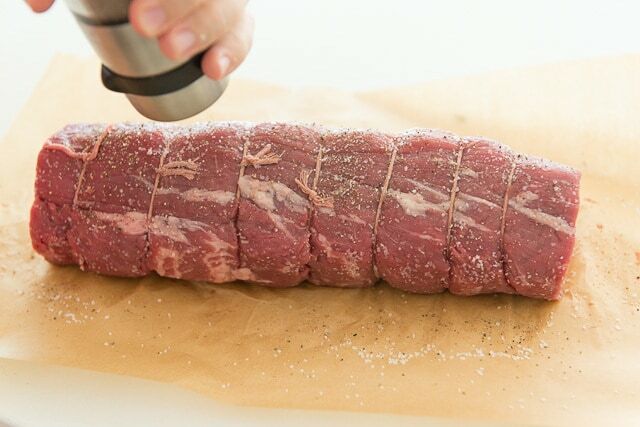 Season the beef all over with salt and pepper. As a guideline, I use 1 teaspoon of salt total. Heat a large skillet over medium high heat and add the oil. Sear the beef on all sides, until deeply brown. This takes me about five minutes on a gas stove, but it may take you up to ten minutes. You’re going for more of a color than a time here, as you want to make sure it’s well-browned. In the meantime, melt the butter in the pan you cooked the beef in, and add the mushrooms. 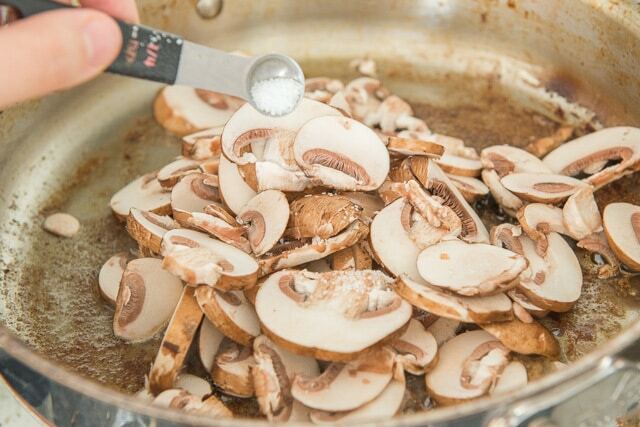 Season with a pinch of salt, about ⅛ teaspoon, and cook for about 10 minutes, until all of the moisture released from the mushrooms has cooked off. 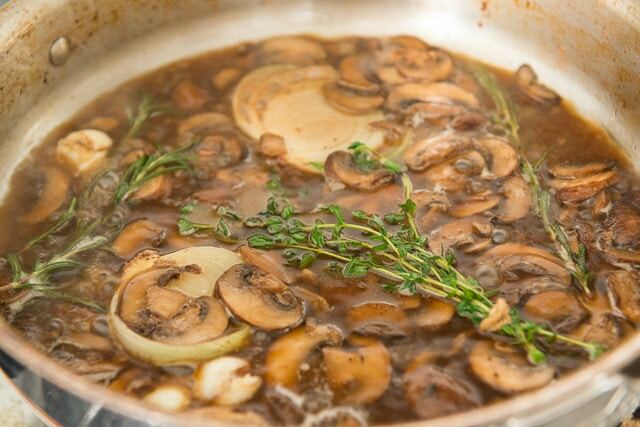 Add the garlic, onion, rosemary, thyme, and Swanson® Organic Beef Cooking Stock. Bring the sauce to a boil, and cook for about 8-10 minutes until the liquid reduces by about half. Remove the garlic, onion, rosemary, and thyme from the pan. The sauce is now ready to stand by for the beef, which should be just about done by now. When the beef has finished cooking, let rest for 10 minutes. 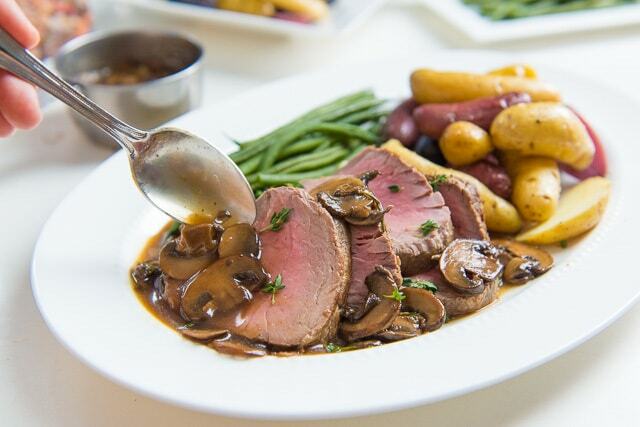 Slice the beef and serve with the mushroom pan sauce. Enjoy! 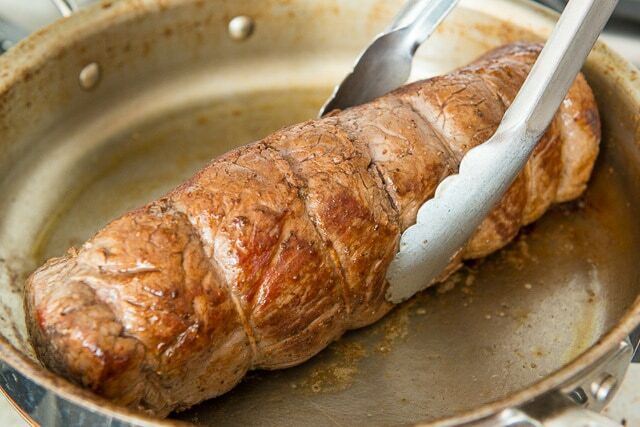 *Cooking time will vary slightly depending on the thickness of the beef tenderloin you use. Make sure to check for desired doneness with a thermometer. Disclosure: This post was created in partnership with Swanson®. I truly love their products, and have used their stocks and broths in my kitchen for years. All opinions in this post are my own. This is such an elegant dish. The sauce is a nice complement to the beef.